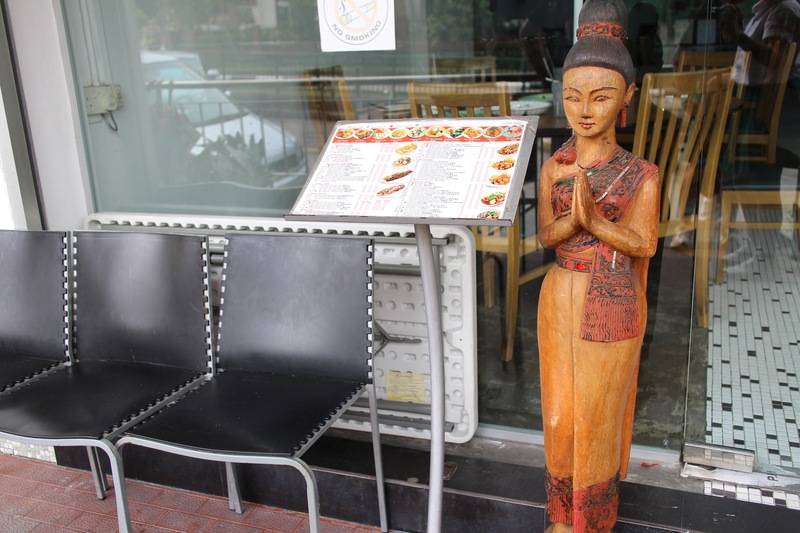 Ensconced snugly in 7 Clover Way between Marymount MRT and Junction 8 is Jai Thai – a popular Rafflesian haunt well known for serving authentic Thai cuisine at student-friendly prices. 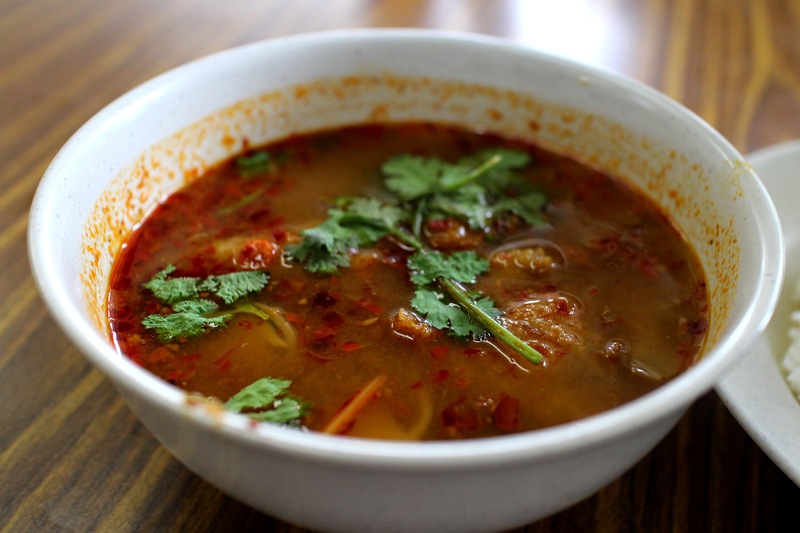 For a couple of years now, it has doled out piping hot Tom Yam soup and other Thai delicacies to hungry Rafflesians looking for a fiery spark to their day. On the heartfelt recommendations of several of my peers, I decided that I absolutely had to check out the place for myself. At my arrival, I was greeted by a traditional Buddhist statue welcoming foodies past the main entrance. The interior was sparsely furnished, but functional enough for a restaurant that advertised itself as “value for money”. The cool breeze of air-conditioning inside provided some welcome relief from the scorching heat that passed for Singaporean weather outside. The set I ordered was the Pineapple Rice set, which was served with a complimentary drink (a choice of lime juice, ice lemon tea, coffee or tea) and dessert. The eponymous rice dish of the set served as a welcome starter to the meal, with the slight crunch of pork floss blending well with the tangy pineapple cubes. Fried rice has never really been my favourite dish as it is usually either too dry or too salty; this was not an issue here as the pineapple and assorted vegetables in the dish lent a refreshing texture to what was a thoroughly enjoyable first dish. 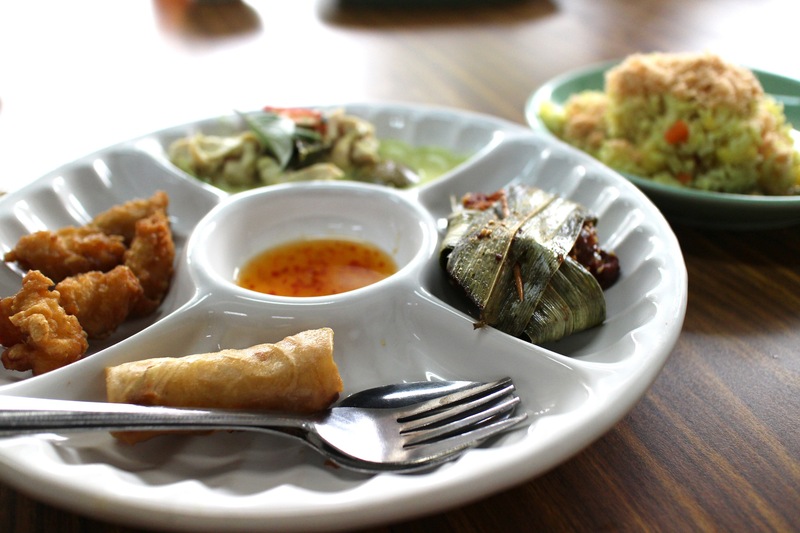 Those familiar with Thai food will no doubt be used to the mouthwatering array of chili, spices and curry that features predominantly in their dishes, and the dishes we sampled featured just that. 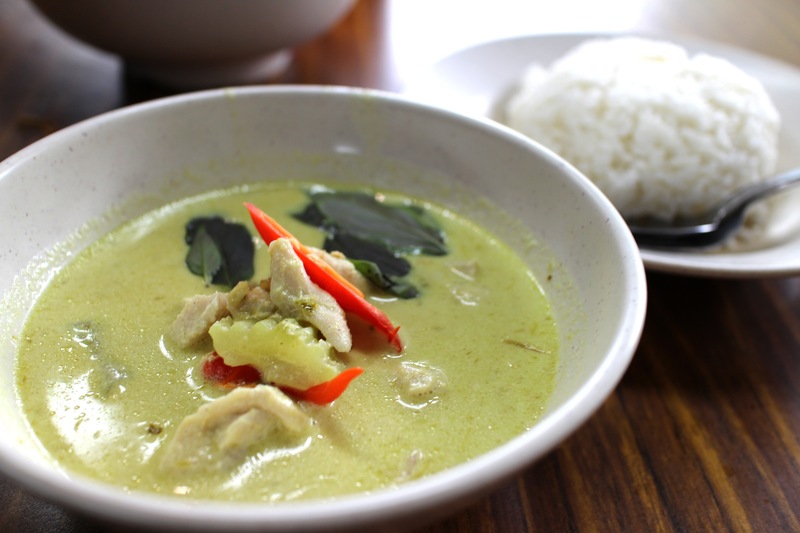 The succulent strips of chicken here lent some much needed flavour to the rice, with the aromatic green curry accompanying but not overpowering the dish. However, diners looking for a bit more more spice in their dish may come away disappointed; the curry here definitely veered more towards sweet rather than spicy – perhaps catering more towards the wider public. Nothing much to be said here. The spring rolls were crisp on the outside and flavourful enough on the inside. The Pandan chicken tasted exactly like any other fried chicken dish I have ever sampled. Both were tasty, but otherwise unremarkable. What spicy horrors await in its murky depths? Of course, no self-respecting foodie would pass up the chance to try Tom Yam soup at a Thai restaurant. 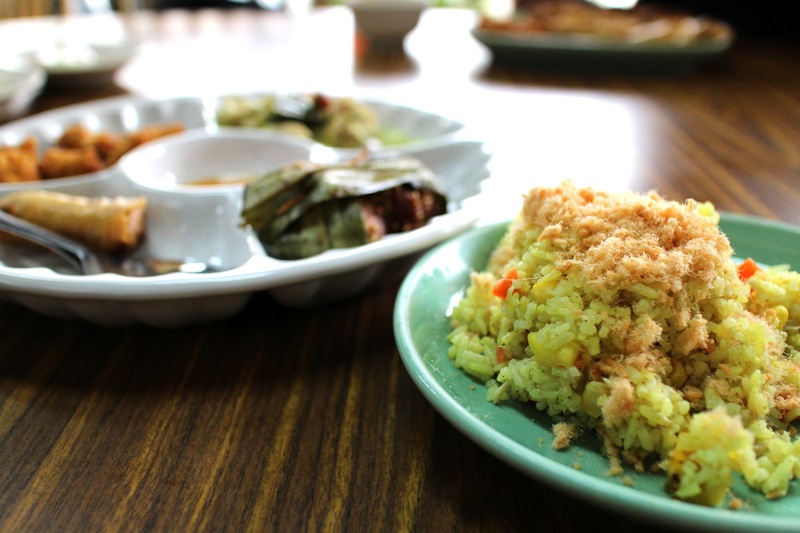 Perhaps the most famous aspect of Thai cuisine, the iconic dish also serves as a test of a chef’s talent and ingenuity. I anxiously awaited the dish with some measure of anticipation, and thankfully it did not disappoint. The fiery red soup featured choice pieces of seafood, including squid, prawn and fish slices, as well as a variety of other ingredients like herbs, spices, and mushroom. This lent a far more nuanced taste to the soup compared to cheaper versions which can often resemble chili mixed with water. A fair warning though, this intensely spicy and sour soup is not for the faint-hearted. While not overwhelming, the spiciness was formidable enough to necessitate the purchase of a second drink (for me at least). 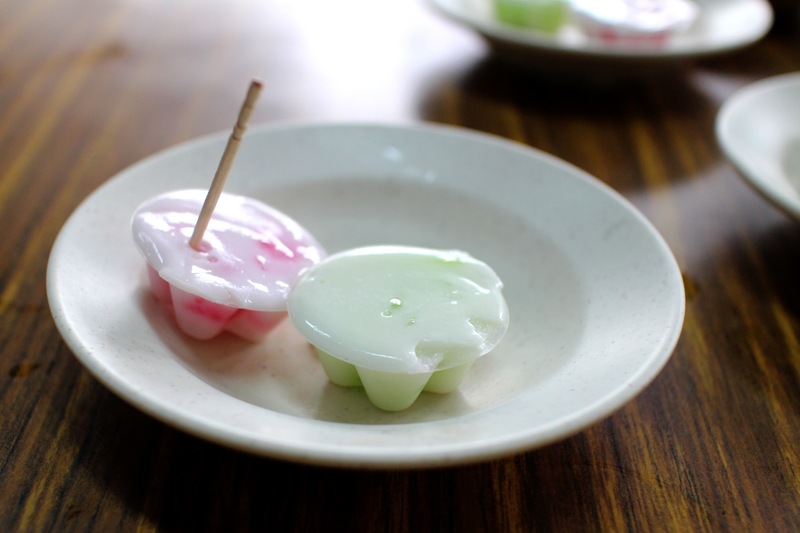 The complimentary dessert was a form of Thai kueh. While it looked promising enough on the outside, it turned out to be bland and thoroughly unmemorable. After a hearty meal, I left the restaurant content and satisfied. While not amazing, the food was certainly authentic enough to make a JC student on a budget very happy. The relatively wide selection of dishes made this an excellent change of pace from the usual food served in the canteen. The close proximity to school is just another cherry on top, making this a place I will most definitely be returning to in the future.